I think we're in full sick mode or at least I hope this is it. I am exhausted. TG didn't sleep well at all last night. It was as if she recalled how awful it was the night before and fought sleep left and right. She woke up twice and headed out to her play area. DH watched her for those 20 minutes while I just lay in bed for a breather. Running on little sleep and DH and I are snapping at each other. The bone of contention at 5am is DH does not want me to take her temperature with a thermometer. His theory, it doesn't matter what temperature it is. She's hot. I think it's psychological. From the minute she woke up, 9am, thank goodness, she's been attached to me like a chimpanzee to her mommy. I've peed with her on my side, brushed my teeth and practically changed her diaper while she was on my lap. Learned that animal planet HD with the african safari is a big hit. She seems to find running cheetahs and lions hunting hysterical. I don't know what to make of that so I'll just chalk it up to it's educational. I passed on a Mom's night out tonight for obvious reasons. DH doesn't understand why but hello, we have a sick kid who seems to want mommy and the breast 24/7. What is eating me though is that we are in the midst of snowcaine 2010 and the snow is just the perfect mixture for playing in and we are stuck inside. 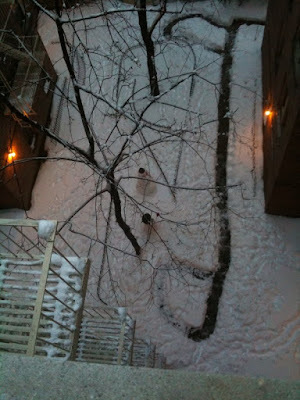 Looking outside my kitchen window I saw our neighbor with her two girls making snowmen. I'm so jealous. Not to give too much away but I seem to have returned to pimples preceding Flo's visit. I am going to guess this will continue for the rest of my life. I don't mind so much because it's not often that I get a huge outbreak. I just think it's funny that I'm still dealing with a pimple or two. Goes to show you how much hormones effect our bodies. I'm pretty exhausted these days. I'm running around a lot and it's hard to keep up. Still I thank God for what I have and am blessed with our fortunes. It could be worse. DH probably has it the worse with school and homework taking over his nights. I hope he gets some rest. Cranky hubby is not fun hubby. I'm a loon. I just bought my 19 month old daughter an interactive map of the United States. You put it on the wall and it has removable parts that let you puzzle piece the states together. I know she's only 19 months old. This didn't stop me from purchasing it though. It's so darn cute. Two days ago, TG pointed to the letter 'R' in her book and said, 'K'. I have no idea where she got this but this has no started me on a alphabet kick. We've always sang the alphabet song and played with her alphabet magnets but now I'm pointing them out to her everywhere. It then dawned on me that we spend a lot of time sitting and eating on the dining room table. Most of the time, I place her in there to begin eating while I plate up in the kitchen. Why not make use of that time and place alphabets along the wall for her to look at. I'm not expecting her to recognize and memorize them but hopefully staring at them and pointing at them every now and then will help things stick. So off I went to find alphabets to stick on the wall. Normally, I'd probably make them myself and I plan to do a letter project a week with TG when she's older. For now though, time is limited. So I picked up a set of alphabets to place on the wall and that's when I found the US Map. I had to have it. My eyes lit up. Heck, maybe DH can find this useful. The man is awful with navigation and geography. On the way home from the museum of natural history, DH sprinted with TG home as I trudged up the stairs with our toddler bag of goodies. Moments ago, as we were in the elevator of the subway station, TG turned to me and asked for her lovey. As I handed it to her she replied as always with a clear, "Thank you." eliciting numerous awes from the fellow passengers. As she giggled and chuckled as DH carried her home, a fellow rider turned to me and said, "So it does turn out to be fun, right?" I looked over to see a weary man with day old scruff staring at me pleading that the light was in sight. "My wife and I just had a baby 14 days ago. It gets to be fun, right?" "Yes but you are in the thick of newborn-hood and sleep deprivation." "Yes, it's a lump of dough essentially until about 3 months when it's a lump of dough that looks perplexed all the time. Then it drools for Lord knows how long and then starts making interesting gurgling sounds. Until then, it's just sleep, eat and pump." is what I wanted to say. Instead I just said, "Yes, it's a doughy mass you have no idea what to do with until one day it starts interacting with you." "I just can't wait until she's 2 and she's rational." "I'm sorry to break the news to you but rational is not what I'd describe a child at any age." What's it to my husband if I continue to breastfeed? So DH wants me to stop nursing when TG turns 2. I'm not sure I'm ready for that. I am leaning towards reducing nursing but not completely stop. It's a little psychological for me. Just like my period, it symbolizes my body ramping up for the possibility of another child. Plus, I know nursing gives my daughter comfort. Nowadays, I nurse mostly at night but during the day if she asks for it. I generally don't nurse in public as frequently but if TG is having a time of it and requests it, I may do so during her playgroups. Remember how I wondered how moms would shift away from doing it in public? It just naturally happens. Don't get me wrong, if TG is having a fit and honestly needs it, I'll offer it but when she's just asking for quick comfort I usually tell her later and offer her a hug or a cuddle instead. She has a favorite chair she likes me to nurse her in so I tell her later when we are home in the chair. We sit there and she brings her puppy puppet and a book for me to read while she nurses. I can clearly see it's just bonding time she's after. Still, I'm not sure how to broach my husband's request. I think I need to speak to the other nursing mothers in our support group. I mean, the burden is more on me than him. Why should he have such a strong opinion? Maybe if I broach it as, nursing in private only he'd be more receptive. He clearly sees and announces the benefits of breastfeeding to others. TG has only been mildly ill twice. Her cognitive development is high. Her social skills are strong. Her connectivity to us is tight. The toddlers we know who continue to breastfeed are less likely to catch the bug that passes around the group, seem more attached to their parents and appear to be thriving and happy. I'm really proud of our bond and our connection and our triumph over the breastfeeding difficulties of infanthood. I'm not just ready to say goodbye to that and the prospect of discussing the even more difficult conversation of a sibling for TG. That's Happy New Year in Cantonese. Literal translation = New (Sun) Leen (Year) Fai Lok (Happiness). That's your language lesson for the day. Went to my Mom's for the traditional new year gathering. Dressed TG up in her cheongsam but American-style. It's freezing in NYC so she had a henley on underneath. She also had red tights and rainbow legwarmers. What? She's a toddler. I can do this to her now. I also put the henley on underneath because I have this thing about her having 100% cotton on her skin. She had a grand old time playing the very out of tune piano at my Mom's. She also enjoyed walking around the kitchen. My Mom's kitchen has two entrances. This reminded my mother of how my father decided to buy the house many moons ago. Apparently after an exhaustive day of searching and dragging me in my stroller, I ran around the kitchen like a kid letting steam out. This was taken as a sign that this is the house we should buy. I'm not sure how true this is but I've heard it so many times, I take it as so. TG was so exhausted, she fell asleep on the way home and slept a total of 6 hours straight! This gave DH and I a chance to enjoy Valentine's Day together. We spent the morning having a V-day breakfast, Steak, Eggs and Potatoes. It was a big feast allowing DH to have a big meal before heading over to my Mom's. We had heart shaped blueberry pancakes on Saturday. While TG slept and dreamt of out of tune pianos and circular kitchens with beaded entrances, DH and I caught up on the Olympics while noshing on chocolate ice cream with blackberries and dark chocolate covered strawberries. We promptly passed out on top of each other like beached whales. We woke up at 2am when TG toddled over to us half dazed with her lovely firmly grasped in her hands. "Bed? Bed?" she inquired. "Yes, let's go to bed, TG." I am so done with winter, at least winter in NYC. The wintery white has now become grey ice with flecks of brown and yellow. Ewww. I've been on a shoe hunt for TG. She's a size 6 shoe now which means I need to buy size 6.5. First of all, can I just say, can the shoe makers pick a size for toddlers already? One shoe company has her as a size 22-23. Another has her in a size 6.5. Another has her in a size 7. What gives? I tried measuring her feet in inches or centimeters to use as a gauge but some companies don't even offer that kind of measurement on their website. I'm obsessed with this one pair from See Kai Run. It's the Brenna shoe. It is so gosh darn adorable and of course I can only find it in a size 3 toddler. For a woman who was obsessed with shoes BC(before child), you would think my toddler would have a million pair of shoes. Not so. She has only had 6 pairs of shoes so far, 2 dress, 4 sneakers. This is my thought. 1) Kids feet grow at an exponential rate so why buy a million shoes. 2) Toddler is still learning to walk and balance and run and jump. Sneakers, soft and flexible soled seem like the logical choice. 3) I'm cheap but in a good way. I figure I'll spend more money on quality versus quantity. So she may only have 3 pairs of shoes that fit her now but they are of good construction and quality. At this point, she doesn't have any dress shoes. On the occasions we've had to go out to a dressy function, she's worn her sneakers but I think she can get away with that now. 1) It's winter here in NYC and 2) Toddlers look so darn cute in anything you put on them. The spring it coming though so I'm the hunt for a spring dress/play shoe. I'm a fan of classics and new classics. Hence my obsession with the shoe above. It's classic but in a new way and they are super flexible and come in wide which is a plus for TG who has inherited DH's and my wide foot. You'd think shoe shopping for my kid wouldn't cause me such grief. One man's outlet is another man's chore. Now if only that chore was something that would take a load off of my list of to dos. A blizzard hit NYC. Schools were closed and for the most part folks stayed home. DH took TG to the natural history museum again and I worked from home. TG isn't a big fan of the snow. She loves the outdoor but mostly when during the spring, summer and fall. I don't think she knows what to make of snow. DH made a snowball for her again. She was disinterested. He then showed her she could eat clean white snow. Again, she wasn't interested and began her Woody Allen no rant. TG has started what folks commonly call the 'Terrible Twos'. This is the stage in which toddlers start to test their boundaries and explore independence or so the books tell me. What's maddening for me is that she clearly knows she's not supposed to do whatever it is she is doing and will wait until DH or I are present to do so. She'll even wait until she received eye contact and then smile and proceed doing what she should be doing. Clearly, she could care less about the actual action but much rather wants to see the reaction. I knew this day was coming but I'm still at a loss on if I'm responding correctly. If it's something that isn't dangerous and mainly annoying (ie. banging a toy on the floor) I state we don't bang the toy but roll it/push it/pull it/etc... and demonstrate. If she continues, I ask her to show me how to roll it/push it/etc. If she continues banging it, I tell her again we don't do so and that I will take it away if she continues. If she continues, I take it away. She doesn't protest usually. She just goes about with another toy. That's what's nutty. I know she could care less but she just wants to see the reaction. If it's something I think she's doing to just get a rise out of me or attention of some sort, I either ignore it or distract her by calling her to me to help me with something. Most of the time this works but sometimes, I go back to 'We don't ... We ..."
The hardest thing for me to deal with at this point is the knowledge that she wants to climb things, especially when I'm in the kitchen preparing a meal/snack. It's as if she knows I'm indisposed. Clearly in her mind she's not waiting for me to be unavailable but that I just so happen to be unavailable. There is only so much I can really do to distract her and keep her entertained while I'm chopping up onions. It gets super hard when she starts whining for me to pick her up. She clings to my legs and pulls my pants nearly off and incessantly states, "Down? Down? Down?" She transposes up and down when it comes to requesting a pick up. DH thinks it's her asking us to get down so she can get up. Sometimes she's just curious to see what I'm doing. Other times, she just wants me to hold her in my arms. There are somethings in the kitchen I can do one handed while holding a child. I've made scrambled eggs one handed. I've made pasta one handed. But there are other things like handle raw meats and cutting that can't be done one handed. I'm still hunting for an affordable step stool that I can feel comfortable with TG standing on in the kitchen. We have one in the bathroom but it's a smaller variety and I don't let her stand on it without me behind her. In the kitchen I need to be able to move around. There is this one that I always see in my Google searches but it's awfully big and ugly and super expensive. If I told my husband I spent over $100 on a step stool, he'd have my head examined. I'm hunting for an alternative or a sale on this bad boy. 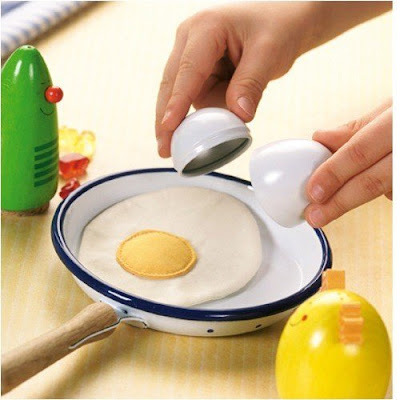 I have a daughter who is super curious about cooking and I envision we'll need something like this for years to come. Have you ever woken up feeling more tired than refreshed? Such is my day. I can't seem to concentrate and I feel like I'm in front of tennis ball machine and I'm getting pelted left and right. I suppose it was a restless night's sleep but surprisingly, I got more sleep last night than most nights. I noticed DH looking a bit haggard as well. I think we both need something to refresh ourselves. What I don't know. TG has been testing now. She seems to have started to test what she can and cannot do with us. The latest is not eating her eggs and feeding them to the dog. Personally, I'd probably just stick with the yogurt for breakfast and give her a protein for lunch until she's past this whole no eggs kick but DH feels its important to have a protein for breakfast. I agree but I'm not going to fight it, especially when I feel this tuckered out. Maybe tomorrow I'll make the egg into 'spaghetti strips' and see if she'll eat it. We have another crazy week ahead with Chinese New Years and Valentine's falling on the same day. I usually don't make a big deal about Valentine's but since DH and I seem to need some type of pick me up, I've got something up my sleeve. Oh, I looked over my recipe book I was compiling for my future kids and I realized, wow, I have tried to make a lot of stuff and a lot of it sounds yummy. Maybe I should take a page or two and make those dishes instead of just the same old same old. I know that sounds simple but for some reason, I've completely forgot to look back at my homemade recipe book. Oh and just because I'm feeling non sequitur, two nights ago, I dreamt my husband was Jack Bauer and our house kept getting invaded by foreign military. Strangely enough, even though it was annoying, I felt my daughter and I were safe knowing my husband was Jack Bauer. It was bizarro as they literally would come in with guns pointed at us but I wasn't scared. Now if this was really '24' and not my dream, I'd be peeing myself as family seems to be the first to go on the show but I was calm enough to offer the folks who held us hostage something to drink. What the heck does that mean? Sometimes I really hate being a woman. Mothers truly make this world go round. The statement that pokes me in a place that sends me into full wrath is, "Things always work themselves out." Do you know how things work themselves out? Mothers. Without mothers, things would stay lost forever. Without mothers, socks and underpants would be worn until the elastic falls off of the overstretched, see through loincloth that once held the shape of underpants. Without mothers, bathrooms would never get cleaned. Mold and mildew would rule the world. Toilets would come in brown tones to mask the never cleaned inner bowl. Ovens would be pristine as take out would be the number one source of nutritional consumption. Attachment parenting would consist of men bungee cording their toddlers to their belt loop. Multi-tasking would consist of holding a beverage while surfing an iPhone. Honestly, I don't mind doing what I do because I know it needs to get down and it, in the long run will make my family's life better and happier. I don't like to talk about it. I don't like the whoa is me connotations. 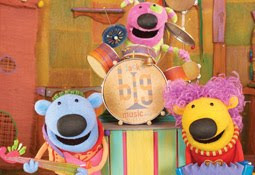 I know every mother out their is a three ring circus. We don't want accolades. What we want is, when we ask you to throw us a frickin' bone, to not asks us what type of bone and where to friggin' find the bone. My kid loves soup. My 19 month old takes to soup like an elderly person. Yesterday, my daughter ate an entire serving and a half of chicken soup with carrots medallions, sliced bok choy, celery and bite size chicken breast nuggets. She used a straw to drink the literal last drop in her bowl. She used her spoon, her fork, my spoon, my chopsticks. When I see my daughter's grin as she's enjoying a home cooked meal I know I'm doing something good. Today is my mother's birthday. It's a milestone birthday. We got together and had a nice seafood dinner at my place. I spent the day prepping and cleaning. It was cathartic and in a strange way symbiotic. TG and I were home and we worked together to get things done smoothly, quickly and easily. I gave her the duster and she went around the house pushing and dusting the lower shelves and floorboards. When I had to vacuum, her least favorite object in the house, I made sure I warned her and did so as far away as possible from her. I think she's warming up to it slowly as she not only pets the vacuum when it's not on but now realizes it's role and job and doesn't scream out, "All done!" when she hears it turn on. After I vacuum an area and turn it off, she'll toddle over to it and touch it and look at me. When I warn her that I'll turn it on again, she'll toddle to another room and wait for me to turn it off again. She still happily closes the utility closet door when I put it away though. Slowly but surely. Her doctor said that her aversion to it may have come from something that happened when she was younger. "Perhaps, someone vacuumed next to her or worse used the arm attachment near her. Adults forget how monster like a vacuum can seem to a small child." In my list of to dos for the shindig, I also had two wishlist items that we were able to accomplish, take a bath/shower. TG woke up early from her nap and we both were able to wash up. This was much needed as TG smelled like soup. At least soup for the most part is homey and evokes comfort. I'm surprised Yankee Candle hasn't invented a 'Soup' scent. My brother had a great idea of encapsulating my mother's hand and my daughter's hand in clay mold. My mom seemed to like this but I don't think she quite comprehended what we wanted to do. She seemed distant. TG did make her day when she called everyone by their Chinese titles. She even called my mom by her title without a reminder or a request. She toddled over and gave her a ball and said, "Paw Paw? Ball." That was probably the best gift she received. The day before TG and I worked on an art project for her as a present. TG painted a picture and put stickers on her modern artwork. She gave it to her today and she was thrilled. I'd like to think my mom was pretty proud of TG and in a small part me for how I am trying to raise her. I know she doesn't completely understand how and why we do what we do but I think she knows we are doing what we think is best. TG likes to take apart my husband's wallet. As of today, my husband is now missing all of his bank cards and a few ids. We have no idea where they may be. When I hinted they may be in the trash, my husband was rightly upset. I'd like to think my toddler wouldn't throw anything but trash in the trash but she may have a different definition of trash than us adults have. Heck, she ran around with the toilet plunger the other day much to the disgust of my husband who nearly did a Silkwood on her following the plunger incident. Surprisingly, I'm turning out to be more of a laid back mom when it comes to messes. I was wondering how my OCD would be and if I'd be some Mrs. Pristine type of mom. So far, I'm probably more open minded about messes than my husband. For example, I don't feed our daughter. I let her feed herself, even if that means she uses her hands, every utensil on the table including ours, spills most of it on herself, the floor or the dog etc. DH cannot stand this and will feed our daughter. For him it probably seems more efficient. It takes less time and it's less messy. For me, I'm all about her having fun exploring her food and listening to her tummy. I'm also keen on her mastering utensils. You can't do that without application. Guess that's what you get when you learn to use chopsticks at an early age. Even with painting, I'm pretty laid back, I think. Clothes and the floor can always be cleaned. Today, while TG was making a birthday painting for her grandmom, she Jackson Pollack'd her feet. I thought it was cute and took a picture. I drew the line when she tried to grab my phone with her purple/orange/turquoise hands. Honestly, I probably don't mind so much the crayons on our wall because I know they are washable and in a totally revealing admission, I love the fact my house has signs of kid life in it. I sometimes complain about having to wake up at 3am to tidy up toys and broken crayon pieces but I don't mind so much because it's evidence of kid fun. I want my child to never feel confined to some Victorian childhood. Dresses with matching hats and shoes are great sometimes but there is something to be said about a tee-shirt and jeans/sweatpants. Now if I can only somehow get DH to hide his keys and wallet or put them away. It's hard being everywoman. It's even harder trying to keep my ideals and beliefs into play. When it comes to food I'm a stickler for healthy low processed foods. I believe what I put into my family's body affects their health and well being. I spend a little more, invest a little more time so my family benefits. Occasionally time gets the better of me. One of the benefits of my OCD is I usually have backup plans. I try to have something marinating or parcooked in the freezer or fridge. I used to make large batches of food and freeze for such an occasion. If you followed my pregnancy you know that I made large quantities of food and labelled them for my husband to cook. You can blame my OCD or whatever but the instructions were for naught. With DH's attention to calorie counting preparing a meal has gotten a little more stressful. I try not to leave extra portions and meals premade to prevent him succumbing to temptation. That means more on the fly cooking. I don't mind as it is healthier to avoid family style meals but that means my nights are a whirlwind of activity. It's gotten to the point where I know my eyes don't seem focused and I may appear at a distance. As soon as I get home it's a card game of spend time with TG, clear the kitchen, prepare a meal, tidy up the play area (the entire apartment essentially), catch up with DH before he leaves, decompress from the day & prepare TG to go to bed. All this while trying to convey a tranquil soothing going to bed atmosphere. I know I'm not the only mom out there who is going through this. Some have it better. Some have I worse. I'd just like a lifeline right now. Ten minutes locked away would be nice. Stickers are a big hit with TG and her playmates. Even on the airplane, she took stickers and placed them on the television monitor. Thankfully, this mommy was smart enough to bring along the repositionable stickers. We also started introducing painting with a brush and that seems to be a hit. The crayons were being used more as teething devices than for actual coloring, unless you count coloring of ones teeth. To save money to help tiny toddler fingers, I have started making stickers out of heavy stock construction paper. I punch out 1.5" square pieces and stamp them with numbers, letters and shapes. I then place them on wax paper and the kids can peel them off and place them on paper or back onto wax paper (TG's favorite). I'm trying to think of a cool project for Valentine's day for a nearly 2 year old. Since she seems to like the heart shape (she placed heart shaped stickers all over her Dad's foot the other day), I'm thinking of drawing a heart and then using red construction paper to practice tearing and gluing. I think it's a bit advanced and I' not sure how the tearing will be interpreted (books? magazines?). Maybe next year. I can always just make heart stickers again. We'll see. Oh, apparently the food strike is going around. All her playmates have been leaning towards the finicky end this week. We did manage to get two out of three kids to eat breakfast one day when all three sat together at the dining room table and ate. Of course, my daughter, the one who likes to feed everyone, initiated this with a very clear exclamation, "Hungry." I love how my 18 month old can tell me clearly she's hungry. Next thing you know, she's passing pancakes to her playmates and their noshing and gabbing at the table. I may have to start making the sweet potato pancakes again. Still a no go on whole green veggies.